Web conferencing is a widely used method of approaching clients with new products and services you offer that can benefit them. However, before you even offer one of these presentations, you need to make sure you work out the logistics of webinars for a sales demo. First, you need to find a provider that is easy to use and allows you the flexibility of creating and using these presentations at your convenience. Before you use one of these sales pitches with a client, you should also touch base with your client to make sure they are capable of using the method you have chosen. Practice is also essential to iron out any glitches or other flaws before the actual presentation. If you are already in sales, you should know the basics, but it is often easy to forget in the heat of the moment. 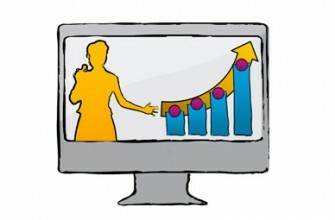 To ensure your sales demo goes as smoothly as possible, webinars should focus on the sales aspect of your pitch. Showing off your products or services is still important, as is listening to your clients and offering them valuable insight, but if you don’t encourage them to buy, you are missing the point. Don’t allow your sales web conferencing turn into an informational session only. The information is critical, but the event should always end with a solid sales pitch so clients will attach the product or service with your company in particular. Your clients are busy running businesses of their own and don’t want to waste a significant amount of time on a sales demo. Therefore, you need to keep your webinars short and to the point to provide them with all the necessary information and yours sales pitch within a reasonable amount of time. Don’t drag out your final point longer than necessary. While there’s no need to rush through your presentation, you also don’t want to take up too much of your client’s time. Facts are important when you are trying to make a sale, but they are quickly forgotten after your web conferencing event. One of the oldest sales tips is to use stories to illustrate your point. People have an easier time remembering stories than they do facts, helping them remember your sales demo long after you are done. Stories are also a great way to hold interest. Listing facts upon facts quickly becomes boring, losing your audience before you reach your sales pitch. Make sure your story illustrates a problem and shows how your solution can resolve that problem for the greatest impact. It can be extremely difficult to create an effective sales pitch when you don’t know exactly what your clients need. It is your job to research into the company, including who will be watching your webinars, what the company does, what their needs are and how you can help them meet those needs. When you go into your sales pitch armed with detailed information about the company and the person with whom you will be interacting, it will show you in your presentation. The client will see just how much you care about them and meeting their unique needs. Clients want to know that you are working for their benefit. When you give your sales demo online, you should reach out directly to the client who is watching the demo. While you may give this same demo to multiple clients, it isn’t difficult to swap out client names and add a few additional details about the company you are currently reaching. When clients see that you have taken the time to customize your pitch to their needs, they are more likely to turn to you when they are ready to purchase the product or service you offer. It is so easy to start your web conferencing event with a client and go over the full list of features the new product or service will offer. While it is important for the client to know the features they will receive, it is even more important for those clients to understand exactly how the product or service will help them. Listing the features will also make for a boring presentation. Instead of simply listing features, give examples of how the goods or service will benefit them and resolve the problems they are experiencing. If your clients leave your sales pitch knowing exactly how they would use the focus of your presentation, you have succeeded. One of the best ways to reach out to your clients is to listen to what they think and need. The great thing about web conferencing is you are able to interact with the person on the other side of the screen. Instead of spending the entire allotted time talking, potentially losing the interest of your client, leave plenty of time to answer questions and actually create a dialogue with clients. The more you listen to your clients, the better you will understand their needs and what your business can do to help. Like many other areas of your business, it can often be most beneficial to be flexible in your presentation. It is always important to plan out your webinars to make sure you don’t forget something important or go off on a tangent. However, you should be somewhat flexible and allow your client to mold the conversation to meet his needs. While you shouldn’t hesitate to redirect if the discussion falls too far off topic, it is good for you to allow your clients to take the lead. After all, you are trying to make the best possible impression on your clients. Businesses are often hesitant to try out a company that hasn’t provided success to someone else already. You can boost your chances of making sales by providing real examples of clients with whom you have worked to create a valid solution to their problems. Make sure you talk to all your clients about using them as an example of the work you can provide. With the assurance that you have been successful in the past with businesses just like theirs, you increase your chances of making a sale. 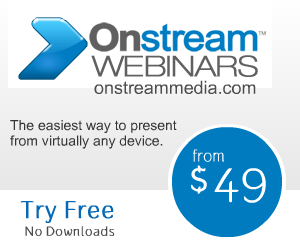 Follow these simple sales tips and you will see great results for your Onstream Media webinars. A sales demo online is a great way to reach the largest number of customers and make the biggest impact without spending a lot of time and money.